Following approval system Delta4 Discover by Varian for clinical use, Elekta has already signed an agreement with ScandiDos interoperability so that is the last step for final validation system for use with patients. In this sense, Discover Delta4 becomes the first clinical use system validated for clinical use by the two leading manufacturers of linear accelerators market. Since this week, Varian accelerators users already have the approval of these to install this system on its head and treat patients. With this announcement, Discover Delta4 becomes the first transmission system detectors before validated patient for clinical use. More details on Web Scandidos. ScandiDos is already finalizing the details for validation with users Elekta. 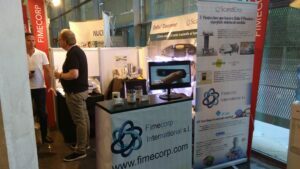 Fimecorp International was present another year at the joint congress of the SEFM and SEPR in Girona. We are introducing the new design Delta4 Discover, much more in line with new models of current accelerators. Another product that caused a lot of interest is the film Radiochromic EBT3-XD, with wide range of dose reaching the 40 Gy. But without any doubt, the system that is causing a stir Delta4 Phantom+, It is the first dosimetry system pretreatment wireless, something I really liked all visitors.